A spoonful of sugar about the flu for you. Flu facts to get you in the know. How it would be lovely to be so trusting nowadays?! Alas, the age is upon us of home googling and self-truth-seeking. But, if you’re up for something simple (& you trust me), then read on to learn a few funky flu facts that I’ve appreciated since learning more about it all in the medical world being a GP. The flu gets you before you even know you have it. This is what we call the incubation period. The time before symptoms show (i.e. you know about it) -by this time you are already replicating the sneaky viral beasts! In the case of the flu, this is exactly what it wants – to spread & procreate! We are contagious before we even know it! (*thus the reason prevention is much more ideal). So if you’re sick and still not sure where you got it from – stop thinking. It’s fairly impossible to work this out; because maybe it’s from the checkout at the servo, or maybe the gate handle at daycare pickup?.. So that first tissue you dig for at the desk, turn to your work neighbour and apologise, because surely surely you have already given the gift onward. Sharing ain’t caring. 2. It lands people in Intensive Care each year – of all ages and social classes. 3. The Flu virus mutates during the season making even vaccination sometimes ineffective – and not lasting. This means each year we need to re-vaccinate ourselves to stay on top as best as we can. Nothing is perfect but something is better than nothing. This antigenic drift (ongoing change in genetic makeup of the Influenza virus from mutating in its environment) means we cannot simply rely on last year’s 2 weeks bedridden experience to ‘get us through’ this year. There is little to no immunity memory or protection as you might relate to with chicken pox. You can most certainly get this bug twice. And sometimes, twice in a year! Taking a chance without vaccination is really a gamble and asking for a ticket to a wasted couple of days flat in bed! The flu shot isn’t always perfect but it’s your best bet. 4. The vaccination let’s me go to the Ekka in (more) peace. OK OK, so it’s a side point – not a true fact. But alas, the peak of flu season falls in Ekka season too. 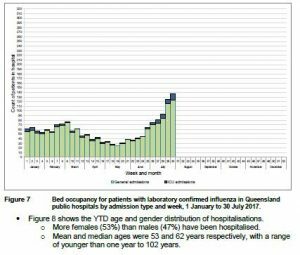 Does the flu spread more because it’s Ekka time (delicious crowds of viral hosts for Freddy Flu), or is the Ekka just coincidental timing around peak flu season? I don’t want to take chances and I’m not a gambling type, so I try to insure myself against more than bad showbags. Alas, these are but a few of the usual urban legends and truths around Freddy Flu. Please don’t hesitate to peruse our website for more information. See your local GP this year and ask about vaccination, or have a chat to your Boss about workplace vaccination programs we can implement. The 2018 quadrivalent batches are available, but the Government stock seems to be set to land (for those >65yrs or with certain health conditions) not until mid-April now.